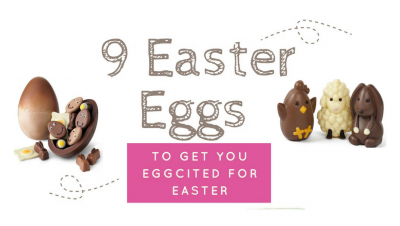 The extra long weekend is almost upon us and Easter continues on the blog and with what can only be described as a genius idea. Enter Funky Nut Co. Easter Egg. 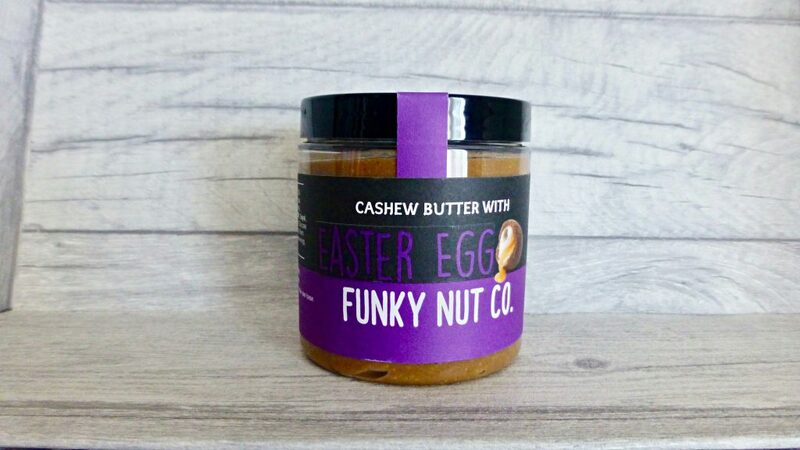 For those eagle eyed readers what it translates to is Cadbury Creme Eggs stuffed into cashew nut butter, but called Easter Egg because Funky Nut Co. got in a little trouble for calling it Creme Egg. I came across this last year and almost took the plunge but decided not too. This year was a different story and alongside my Four Seed Peanut Butter, I purchased this also. Hold onto your easter bonnets because this 265g jar came in at a ridiculous price of £5.50. Yes insane isn’t it. Thankfully I got this at 20% off and free delivery. Naturally this is limited edition and combines their normal cashew butter with a little milk chocolate and those all important Creme Eggs. I have never had cashew butter so a) I have no idea what to expect and b) I have nothing to compare it to. So let’s get cracking. Inside was perfectly whipped and as you can see a mini Creme Egg plopped right on top. 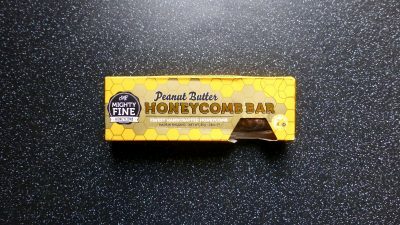 The consistency was thicker than I had anticipated however easily spreadable and the texture had enough bite to it. Frankly this beaut wasn’t going on anything other than a spoon and into my mouth. The milk chocolate was enough to make it creamy and just about chocolatey in taste without being sickly sweet, however it is screaming out for some more chocolate in there. There was more of a savoury tinge to it than I had expected which can only be down to the cashews, which makes this more of a balanced topping. As hoped this milk chocolate cashew butter goes with Creme Eggs like cheese goes with crackers, it’s bloomin eggcellent idea! My one gripe and I am sorry it is a big one, there were two, just TWO mini Creme Eggs. I did expect them to be crushed and whipped into the nut butter rather than whole, but the fact there were two in here angers me greatly, and once they have gone all you’re left with is milk chocolate cashew butter. For what this costs I expect more for my money so despite it’s taste I am disappointed by the hype. Have a great Easter Weekend everyone, what are your plans? 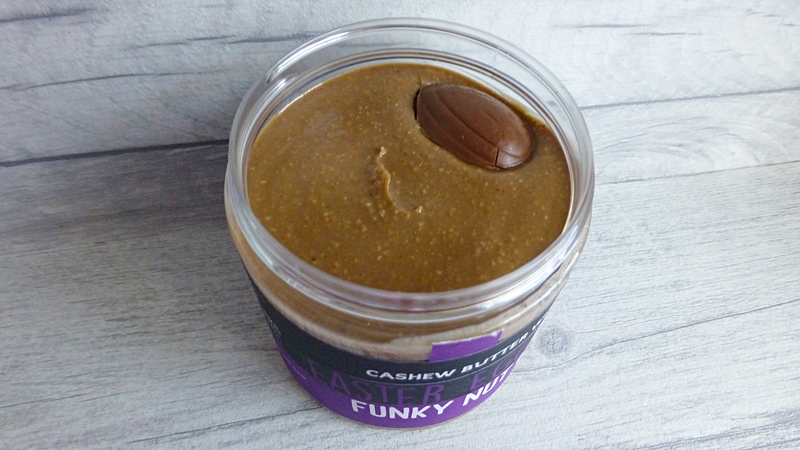 Cashew Butter, Creme Egg, Easter, Funky Nut Co.
I’m rather partial to a bit of cashew nut butter but I completely expected it to have a crushed creme egg swirl through it – rather than it being a chocolate butter with a couple of mini creme eggs embedded in it. Which is easy to do on your own, if you think about it. Not so easy is the swirl concept which I think would make this product stand out. As for the price, I can understand it. I’ve just had to pay over four euros for 150g of cashew nuts. My poor pocket.